Everything's cuter when it's knitted: take this Sonic Sackboy, for instance. Could it make Pokémon mascot Pikachu any cuter, though? Yes, as it turns out, it could. 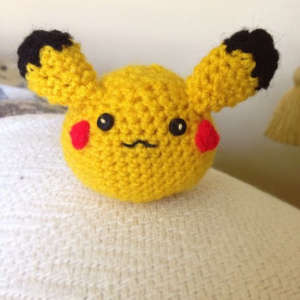 Serial knitster MaDonna — she of Game Boy gloves infamy — spun a yarn Pikachu from her own pattern. We don't know much about knitting, but we're willing to bet representing the world's favourite electric mouse in wool is pretty tough. I think "real" Pikachu is definitely cuter. Covering the most important gaming news as always, I see. @theblackdragon Well I guess that just depends if you interpret my post as being sarcastic or not. Yes, Pikachu is the world's favorite electric mouse beating out the likes of Pichu, Raichu, Plusle, Minun, computer mice, and...um...the Mouse Droids in Star Wars. There doesn't seem to be a lot of competition for that particular title. Awww! Of course, it looks super cute!